Please join us July 2nd, 2013 for a very big announcement. Mark your calendars, link to the webinar, and join us for a very special launch event. 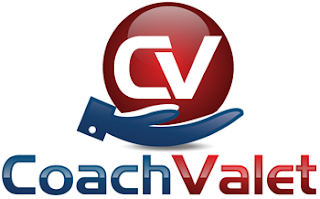 Find out more at www.coach-valet.com. Coach Valet has been in development since August of 2012. Thousands of hours have been logged by our beta testers. And now we are ready for “prime time” release. Note: You can also return to this blog post or THIS page at the appointed date/time to view the webinar. Those same links will take you to the live event. As you can see, one webinar is optimized for North America and Europe, the other optimized for North America, Australia, and the Pacific Region. Small Biz Thoughts always strives to fill a niche that isn’t being filled by anyone else in the small business I.T. community. That’s why I spend very little time covering technical issues in my blogs. That information is abundantly available in many places. Business advice for small I.T. consultants is less common, and almost didn’t exist before I started my blog. Now with Coach Valet I’ll be providing a way for I.T. consultants to improve their business, focus on the future, and stay focused on constantly driving their businesses toward success. I have a very, very special offer for the first 100 people who sign up. Please put this on you calendar and share it on Twitter, Facebook, LinkedIn, Pinterest, and all that other happy stuff out there. I’ll see you July 2nd. - Thank you as always for your support. It’s time- the MAX Customer Conference Series is back for 2013! The MAX Executive Team will be stopping by a city near you this autumn so take a sneak peek at our global Conference page and save these dates in your diaries! Miss out on last year’s event? Take a look at our video from the 2012 event to get a taste for some of the exciting content that we have in store for you. Can you afford to miss out??? GFI MAX conference will help MAXimize your business agility and make you an Agile MSP! Attend a GFI MAX conference and learn how you can quickly turn challenges into opportunities, enhancing your business performance. With a wealth of customer presentations, technical and business sessions, group panel discussions, roundtable, networking and more, there are numerous reasons why you should attend! Early bird registration offers coming soon! Keep an eye on your inbox for more details! The most important topic in today’s IT channel is VARs transitioning from break/fix to the “as a Service” business model. In response, Business Solutions magazine (BSM) will host the Channel Transitions VAR/MSP Executive Conference on Monday, Oct. 7, 2013, at The National Constitution Center in Philadelphia. It’s Time You Made the Transition to Greater Profits and Predictable Revenue. The channel is always in transition, and it seems to be shifting even more rapidly these days. VARs are endeavoring to achieve greater profits and more predictable revenue by implementing the “as a Service” business model. In response, Business Solutions has developed an exciting new resource for VARs, MSPs, and ISVs. - Register early and save! 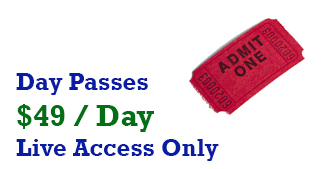 The first 50 VARs who register save 43% off the registration fee. For more information or to register for the Channel Transitions VAR/MSP Executive Conference, visit www.BSMinfo.com/go/ChannelTransitions or contact Business Solutions Publisher Tim Ulrich at (814) 897-9000, ext. 245. Let's be clear: This post is about Collection Policies. For some background and advice about billing and invoicing, see Invoice Review and Processing, Billing Procedures and Policies, Cash Flow: Getting Paid in Advance. So the setup is this: You've either sold hardware/software or services and your client owes you money . . . but doesn't pay in a timely manner. I cannot continue without mentioning an absolute truth of life: You should be pre-paid for as much as possible. For most small I.T. consultants, that means you should be pre-paid . . .
- At least 50% for projects. 100% of projects under $2,500; 50% of projects under $5,000; 25% of all other projects. You can either have the client just pay you, or you can have them finance it through a leasing company. If they finance through a leasing company, you will normall get 100% of all products up front and 100% of labor within three days of the client signing off on completion of a project. Notice that the leasing company gets a percentage of the total. They get paid for lending money and taking payments. That's a very strong clue that this behavior is worth paying extra for. In other words, it has value. So don't YOU give it to clients for free! A client owes you money and they don't pay in a timely manner. For example, we have a very simple rule about collections. On Monday, we review receivables. 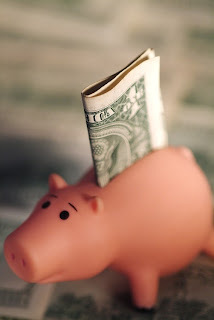 If any client has an outstanding balance greater than $500 that is past due, we assess a late fee of $25 and send them a note requesting payment. We also tell them that their account is "suspended." That means that we'll respond to emergencies, but we will not put updates to anti-virus, we will not monitor backups, etc. In other words, we won't provide them service until their bill is up to date. Many clients have "learned" that Net 30 really means 30 days, but not really late until 30 days later, so they always pay on day 59. Whoever is teaching this stuff will burn in hell forever. You don't have to put up with it. First, set your terms to be Net 20. Then charge late fees on day 21. If you have any questions about the amount you owe, please give us a call and we’ll be happy to discuss it. If you’ve already sent your payment, please disregard this reminder. We appreciate your continuing business, and we look forward to hearing from you shortly. If you're not sure how to start a collection letter, go into QuickBooks and look at the same letters they've put together. QuickBooks has "friendly" and "harsh" letters. And of course you can Google collection letters to find more. The important question is, what are your policies? When a client invoices goes "late" what do you do? What's the first thing? What's the second thing? The easiest way to build this policy is with a timeline. For us this starts every Monday when we review past due invoices. If anyone owes more than $500, and it's past due, the office manager sends an email similar to the email above. And she assesses a late fee. On the first business day of the month, we assess a finance charge to all accounts that are overdue. QuickBooks has an automated feature for this. If any accounts are 30 days past due, we cut off service, as described above. In the very unusual event that someone is 60 days past due, we write them a letter cancelling the contract. (At a later date we can discuss the emotional "stuff" you feel about this. Suffice it to say for now that this is NOT your best client. And they don't respect you. And they don't love you. No matter what other story you tell yourself in your head, you have a financial relationship with your clients. If they stop paying you, they break that relationship. Please take note of Absolute Truth of Life #2: Money owed to you can never have a value of one doller per dollar. In other words, you will collect less than the face value on ALL past due amounts. In mos cases, you will settle for less. But in some cases, you will pay an administrative assistant or a collection agency. Old money is always collected at a discount. That's why it's critical to get paid in advance for as much as you can. The sad truth is that we accept less than 100% of the money that's past due more than 30 days. So we end up giving a discount to the clients who pay late, while the client who pre-pay and pay on time are penalized. What is your timeline? What's your process? Day 10, Day 20, Day 30, Day 60, etc. Make this as automated as possible so that you don't get involved and extend the pain. Turn it over to your office staff and let the automated process take place. In the course of this series I have mentioned an excel spreadsheet called the Managed Services Grid. Well recently reader Chris asked about this on the blog. And that made me realized that I've never actually "explained" or introduced the Managed Services Grid. So here it is. There's no magic here. You probably have some variation of this. For us, the Managed Service Grid is one place where we keep track of all the numbers related to buying the components of of managed service and selling managed services to our clients. There are basically two kinds of information here: Things we buy and things we sell. See the graphic here. The graphic is actually 1500 pixels wide. So when you click on it you can see it in much better detail. Of course we track the client name. We also need to track how they pay, and the plans they have (such as Platinum Managed Services, Cloud services, and Hardware as a Service). Related to that, we track the nature of the monitoring we do. These include monitoring only, basic patching, fixes, or none of the above. This information is found in the columns labeled Client, Payment Type, MS Plan, and RMM. Each of these things is purchased by us on a per-unit basis. In some cases we sell them on the same basis. At other times we bundle them with other services. In all all cases, we have to pay for every agent used that month - without regard to whether we got paid for it, sold it per each, or bundled it. This information is found in the columns labeled RMM Agents, Spam Filter, and AV Clients. 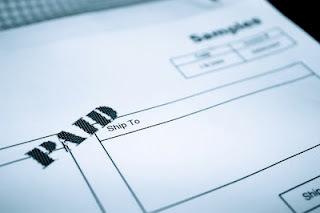 In order to make sure the invoices are correct every month, you need to track the number of machines or devices under MS contract, cloud contract, HAAS, BDR, or some other service. At some level, most of this exists in your PSA. But it's not all in one handy dandy spreadsheet. You need to coordinate this information between your bookkeeping/front office staff, your technical staff, and your PSA. The Managed Service Grid is more than just a cheat sheet for for getting a quick glance payment plans or the number of machines under contract. It is also a tool you can use for communication within your company. Whether you use the system describe here or another, you'll see how useful it can be. This spreadsheet can be used for asynchronous communication for your people. There are two basic rules for this communication. 1) You need a system for staff members to communicate clear, unambiguous information and questions. The following examples are based on the process we use. a) If the front office has a question about any number in the table, she changes the background color to green and enters a note. b) When a technician makes a change in the field, such as adding or removing a machine, he changes the appropriate cell to light red. c) When the front office sees a light red cell, she makes the appropriate change in the PSA and then turns the cell to yellow. d) When anyone has a question, they put notes in the notes field. e) If, for whatever reason, you believe that the numbers in the real world are off from the contract numbers, then an on site physical inventory is required. In such cases, the cell is colored red and a service request is created. The most common use for this is when you are on-boarding a new client. f) Once the service manager has verified that the tech information has been entered into the contracts in the PSA, he sets the background color to "no background." This is the normal state unless a tech of the front office have a question. When notes have been addressed, they are cleared. 2) Everyone must absolutely and definitely use this system. You must be able to trust the system. That means that everyone uses it. Everyone must trust that everyone else has used the system and done their part. This last point is critical. Like documentation itself, the process of maintaining the Managed Services grid is very easy and just takes a few minutes here or there. But if you get behind and can no longer trust it, then bringing it up to speed will take more time. So, the Managed Service Grid is a tool you can use for communication. It is a way to verify how many agents (etc.) you are being billed for. It is a great way to track the services you should be billing. And it is a wonderful quick-reference guide for all of the above. Sign up right now for only $299 when you use the code Secret100 at checkout. Prelude to the Policy: Before you get down to sending out invoices, you need to be very rigorous about getting the right information into your PSA. 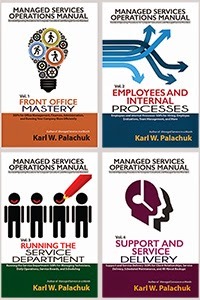 For example, you need to sure about what's Included and Excluded from managed services. Which is to say, what's Billable and Unbillable. Even within "covered" service requests there can be billable time entries. Review your time entries against your policies about on site and off site labor as well as normal hours vs. after hours rates. In all cases you need to keep track of your minimum charges. You also need to apply any credits or write-offs. In other words: GIGO - Garbage In, Garbage Out. You can't get out of the system something you haven't put into the system. You need rigorous procedures to make sure all the time entries in all the tickets are correct. Then you can proceed to the billing process. So let's set the scene: You basically have three times when you invoice clients. First, you invoice for monthly services such as managed services, BDR, hosted exchange, etc. Second, you have project labor that might be billed in advance, weekly, or monthly. Third, you will have product purchases such as hardware and software. That earlier article walked through the process of cleaning up time entries and invoicing for periodic labor. Other invoicing is similar. You need to decide whether you want to run all billing through the PSA or deal with it separately. "Separately" might mean a quoting tool such as QuoteWerks or Quosal, or it might simply be QuickBooks. But what are you billing policies? For most of us, our policies just evolved over time. They may not be coherent. We may have different policies for different clients. Obviously, you can predict what I'm going to say next. You need a small set of consistent policies about how you bill and when you bill. Let's take the three categories one at a time. Let me preface this by saying that we get prepaid for 98% of everything. Everything. Period. I get so much push-back from consultants who have convinced themselves that they cannot get paid in advance. "My clients wouldn't do that. They'd go somewhere else. They'll leave me." Not true. Not true. Not true. With VERY few exceptions, most clients will simply comply. If you feel like you have to make excuses, blame the economy, your supplies, the bank, or me. But just write a memo and be done with it. Think of all the things you pay in advance. Your clients are the same way. Don't have both sides of the conversation! Proposed policy: All monthly recurring charges must be paid in advance by credit card or ACH on the first day of the month. That means you need to get invoices out before the first of the month. About 30 days in advance is fine. We actually do ours ten days in advance. That's because everyone is on auto-pay so they only need an invoice for their records. In my opinion, there is no reason you should not be paid in advance for any service that is fixed fee and monthly. You might be flexible about the the date (1st, 2nd, 3rd of the month), but that's it. You are providing necessary and valuable services. You are committed to your suppliers for the month (e.g., anti-virus, spam filtering, RMM, PSA, email hosting). You have lots of legitimate reasons for being paid up front. Exceptions to the policy: Okay, there are always exceptions, but you can standardize most of them. If client absolutely refuse to pay with a credit card, you can let them pay by check. BUT it must arrive by the first of the month AND they need to pay three months at a time. I think we have four clients who took this route. There are three easy ways to bill for project labor. And there are two types of project labor. 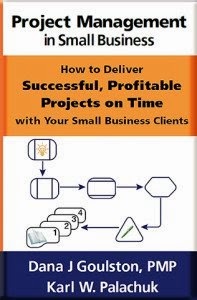 The first type of project labor is "truly billable" labor for clients that is not covered by managed services. For example, we cover the maintenance of the operating system and software. Adds/moves/changes cost extra. So if we install a new program, that's billable. The second type of project labor is actual projects such as migrations, installing a new equipment rack, or moving a client to a new MSP. This kind of labor might be flat-fee or hourly. The first way to get paid for project labor is most relevant to flat-fee projects: Get X% up from and the remainder when the job is finished. Note that X can equal 100%. The second way to get paid for project labor is via blocks of time. So, for example, the client pays you for ten hours of time and then they can chip away at it. When you would bill them an hour, you simply remove 1.5 hours from their credit on the books. The third way to get paid for project labor is in arrears. That means that you bill the client after the work is done and they have a certain number of days to pay. Common time frames are 20 days and 30 days. I really wouldn't make it longer than that. Because we have so little billable labor for clients on managed services, we bill in arrears for that. It's a very small amount and we have terms of net 20 days. Projects are billed at flat fee unless we really don't know what we're getting into. We ask for half up front and the rest upon completion. And that means ON completion - not 30 days later. This one is easy. We got into selling hardware and software when we didn't know anything about the business. We would run to the store and buy something, make very little profit, and then bill the client and let them pay in 30 days. Over time that led to buying from real suppliers (e.g., Ingram/Synnex), making more profit, and much larger projects. In other words, every part of our process evolved except payment. Eventually, we adopted a very simple rule, and I believe you should do the same: We get paid in advance for all hardware and software orders. This is easy to install. Write a memo and do it. "Beginning August 1st, all hardware and software purchases must be prepaid." That's it. If clients would rather go online to Dell, HP, CDW, or Tiger Direct ... they will pay in advance with a credit card. Your clients pay in advance again and again and again with everyone else. You are simply coming up to speed with the 21st century. There are two really great reasons to adopt this policy. First, you are never out of pocket for hardware and software purchases. That means you have conquered cash flow. Second, there are clients who give you the "go" and then change their mind. If the timing is wrong, you've ordered equipment and now you need to return it. In the meantime, you haven't been paid for it. Life is much better when you get paid in advance for all hardware and software. Unlike monthly charges, we have never had any client argue about this or question it. Just do it. If you haven't reviewed your billing policies in some time (or ever), now is a grea time to do it. 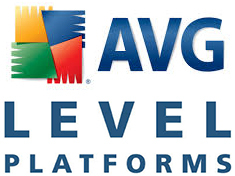 Our friends at AVG have acquired the business of Level Platforms. We are excited to announce that, today, we have acquired the business of LPI Level Platforms, makers of Managed Workplace®, a leading remote monitoring and management (RMM) software platform. We've made this acquisition for a variety of reasons. One of the most important is our commitment to listen closely to the needs of you, our partner. Since its release, many of you have asked us to add fully-integrated RMM features and functionality to AVG CloudCare™. This acquisition reaffirms our commitment to providing features and functions you've requested, leveraging mature, industry-leading technology to do so. Adding Managed Workplace to the AVG product line will give you access to one of the most comprehensive, innovative, high-quality and high-performance platforms for managing small business IT in the industry. AVG will carry on investing in R&D as well as sales and marketing resources in Level Platforms’ software to make sure it becomes the worldwide platform of choice for Managed Service Providers (MSPs) with small business customers. The convergence of IT management and security is a natural evolution, particularly in IT services and the wider SMB market. It was important to us to ensure that the product and management teams inside a prospective RMM and platform company share our own vision, agility, and determination to build the best possible IT management platform we can for the SMB market, and I'm pleased to tell you the team at Level Platforms absolutely does. Over the next few weeks we will begin updating you on the specific details and follow-up activities as they become available. Contact us for all of your sales and technical needs. I look forward to finding out what cool new things these two companies will come up with. Got a memo from the folks over at SMB Nation. Here's the official announcement of the theme and content for the fall show. Stay tuned for information on my 9th Annual SMB Nation Preday show. Media integration company will host this year’s classic fall event, known as “LivExperience” Oct. 10-12, 2013, at the Rio Conference Center in Las Vegas. Bainbridge Island, Wash. – June 10, 2013 – SMB Nation announced that it will hold its 11th Annual Fall Conference Oct 10-12, 2013, at the Rio Conference Center in Las Vegas. With the conference kicking off officially with pre-day sessions on Wednesday, Oct. 9, this year’s theme is based on “LivExperience” and will be touted as an event that will give attendees the opportunity to master emerging technologies, explore the industry trends impacting their MSP practices and customers, and will feature numerous opportunities to network and meet potential business partners. In addition, in order to keep attendees and sponsors abreast of all of the components surrounding this year’s fall conference, SMB Nation has also introduced and launched a completely brand-new Web site specifically dedicated to the 2013 Fall Conference. Go to: http://fall.smbnation.com/, where you will be able to find session descriptions, a full agenda, speaker bios, event details, plus a video from our own Harrybbb, discussing why this year’s fall conference is a must-attend for everyone in the SMB industry. In true SMB Nation fashion, this year’s fall conference will give attendees the opportunity of focusing on one of three content tracks—the "Geek Speak,” Business, or Community track. The Geek Speak Track contains highly technical content with a pathway that focuses on building the “Coolest Company In The World” (CCW), where you complete four classes in a row to understand and implement a complete SMB solution. Following these sessions, you will be able to start building a CCW as soon as you return home from the SMB Nation LivExperience. The Community Track is geared toward channel members who want to network with their colleagues and understand recent developments in the SMB technology channel. This track features a number of SMB Nation community sponsors who will make educational presentations on the industry’s most pressing topics. This year’s SMB Nation Fall Conference has already gained support from an enthusiastic and well-known sponsor community, which includes: D&H Distributing, Microsoft, Lenovo, StorageCraft and Western Digital. • Attendees: 600+ SMB channel partners, consultants, techs, geeks, MVPs and resellers. • Sessions: Over 30+ technical and business content sessions. • Sponsors: Over 35+ SMB technology sponsors/vendors. o Post-Day: October 13, 2013 BIKE RIDE! For more information and to register for this year’s fall conference and pre-day content, please visit our newly launched event Web site at: http://fall.smbnation.com/. SMB Nation is a media integration and events community, targeted at the small and medium business (SMB) channel partner/reseller/consulting/VAR community. SMB Nation spreads the knowledge of SMB technology trends through its conferences, books, digital magazine, online services, and worldwide seminars, workshops and accredited Pocket MBA certificate. As an active participant in the technology community, SMB Nation has a long history of enthusiastic advocacy and evangelism. The SMB Nation tribe exceeds 54,000 followers worldwide. For more information, visit www.SMBNation.com and www.Telephonation.com. Follow us on Twitter @SMBNation, and join our Facebook page at: www.facebook.com/SMBNation. One of the most important elements of a "standard operating procedures" collection is the ability to FIND what you're looking for so you can USE it. Any documentation you can't find is worthless. That's why you actually need some norms or standards around the naming of your procedures and processes. Most of us have phone or tablets with "apps" installed. I don't know about you, but I find it really frustrating when the apps are alphabetized by something other than the most important word. For example, my Delta Airlines app is called "Fly Delta" and is alphabetized under F instead of D. Right next to it is the Free Ringtones app. Under F for free, not R for ringtone. The earthquake app is under R for Recent Earthquakes. The Verizon app is under M for My Verizon. I overheard some folks talking about this problem just a few days ago. They were talking about doing a file search since the key word is somewhere in the title. That's probably okay if you have a few procedures. But if you have a lot, a much better organizational structure is in order. How do you name things so you can find them? After all, you will have a lot of processes and procedures when you're done documenting your business. Here's what we do. 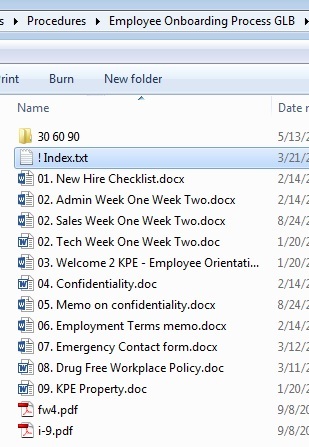 Putting the most important word first allows related tasks to be right next to each other in a file listing. This has several obvious advantages in addition to the fact that it makes it each to avoid duplicates. One important tip on determining the most important word: It's probably NOT a verb or gerund. For example, Reporting is a bad first word because you will end up bunching several unrelated tasks just because they're all related to reporting. Having said that, you can choose to make exceptions. For example, since all invoice is related, you could start several file names with the word Invoicing. Rule Two: Be descriptive. Use long file names if you need to, but be descriptive. It should never be unclear what you'll find inside a document. If you have to open documents in order to verify that you have the right process, you need to rename those documents. Rule Four: Always agree within your team about the names for files. Remember, "indexing" and finding these processes quickly is the main goal here. If two or more people disagree on a naming convention, talk it out, make a decision, and then use it consistently. Rule Five: Do not use the words Process or Procedure in the file name. Everything in the folder should be a Process or Procedure, and the folder might even be named Process or Procedure. Testing is easy. Processes and procedures should be in the first location you look into, and should be named with the first word you were looking for. Just like organizing your house. Where do you kee the tool you use three times a year? You should keep it in the first place you went to look for it. If it's not there, put it there after you find it. File names are intended to HELP us and are not just a required field. Think about the name of the file and make it work for you. One of the speakers at our SMB Online Conference later this month is Mr. Brian Sharp from Go Big. 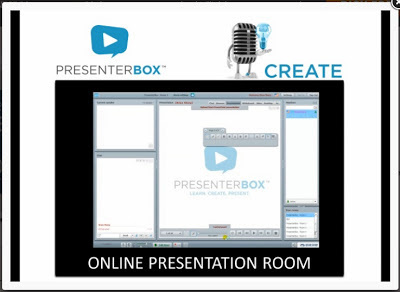 Today Brian is announcing the full release of a great new product called Presenter Box. "With over 120 web pages, 100 videos, 12 months of planning, 9 months of design and 6 months of testing we are ready to go (or as ready as we are going to be!)." You can find out more are https://presenterbox.com - and get it for 50% OFF! That site has a very good three-minute video to describe the service. AND a guarantee of 30 prospects in 30 days or your money back! Got a memo from my friend Dave Seibert regarding a new Microsoft training for Office 365 and Lync/SharePoint/Exchange. If you're interested in seeing the latest version of this stuff, check it out. Dave says this will be published on the Microsoft site Friday but we're okay to share now. There is a new Jump Start live broadcast covering the new features of O365 & what’s needed to pass the 74-325 (not yet published) exam. This live event will be a demo-rich training targeted for IT Pros on administration of Office 365. 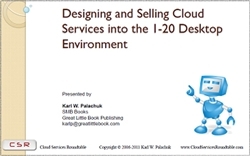 Topic will include migration, deployment, Lync, Exchange and SharePoint. The event is 6-11-13 through 6-12-13.